Gypsum is an inorganic air-hardening cementitious material, mainly consisting of calcium sulphate. Using gypsum materials and relevant products have great significance for saving building materials resources and improving the technical level of building materials. Production cost, Raw material consumption, construction technology requirements and equipment costs are low and production efficiency is high. Gypsum materials have many characteristics like light weight, sound-proof, fire resistance, heat insulation and others. Besides, gypsum resources are abundant, so gypsum has been widely used in building materials. In recent years, due to national control of greenhouse gas emissions, a large number of desulfurization gypsum formed by desulfurization of coal-fired power plants forms a good supplement for natural gypsum resources and becomes an important raw material for gypsum cementitious materials. Building gypsum has many excellent properties and is widely used in building materials. In addition to being used in various gypsum boards, architectural art parts and architectural decoration, colored gypsum products, it is mainly used in dry-mix mortars, such as masonry plaster, gypsum-based decorative mortar, and gypsum-based tile grout. 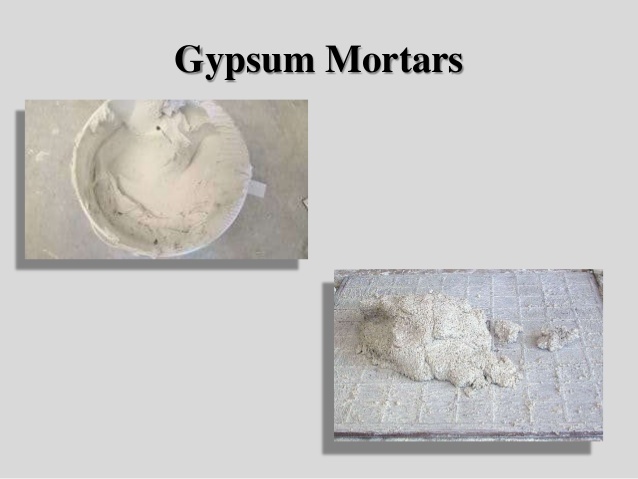 High-strength gypsum is suitable for preparation of plaster dry mortar, decorative dry mortar, self-leveling dry mortar. After adding water repellent to gypsum, it can be made into high-strength water-resistant gypsum for high humidity environment. With additives such as dispersible polymer powder and cellulose ether, it can be formulated into a binder.